A passion for creating something traditional in unexpected ways comes naturally for me. An affection for all things growing has led me to discover the many uses of plants, particularly in holiday decorating. You can make the most of nature’s gifts with an abundance of inspiring options without leaving your own backyard. A gracious garland, lush wreath or simple tablescape can be as easy as knowing what to cut and gather, and how to use it. Evergreens are a seasonal favorite. Basically, there are two types—broadleaf and conifers. Broadleaf evergreens boast leaves, flowers and fruit—think magnolia, boxwood and holly. Conifers (cone-bearing species) have needles—pines, stately spruces, and cedar come to mind. These fundamental and familiar plants express the diversity of our green winter landscapes, allowing us to use what is local to convey the spirit of evergreen tradition at the holidays. Magnolia, boxwood and white pine are the heart of tradition. Bountiful and reliable for their long-lasting characteristics when used indoors, their enduring, ever-accommodating qualities infuse our homes with a rich, timeless sense for the season. Not to be overlooked in favor of new materials, their status quo remains a first choice in selecting evergreens. The simplicity and beauty of any of these as a single variety design can be even more striking if used alone throughout a room or the entire home, or by simply changing how or where it’s used. 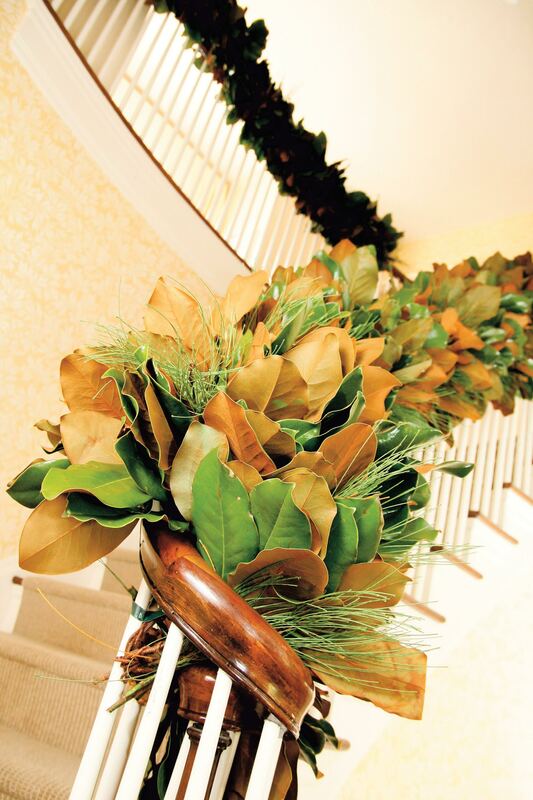 A robust garland can be a table runner; a wreath works well as a centerpiece base. A single evergreen or berried branch transforms a large bowl, basket or otherwise ordinary container into a sumptuous statement. Adventurous mixes, on the other hand, add a wealth of tapestry and interest to design ideas. To enrich a combination, look further to the many options of evergreens for variations in color, shades and texture. Forest greens, blue-greens and yellow-greens are all options in nature’s palette. Along with color differences, the different leaf structures, sizes and shapes present interesting contrast. 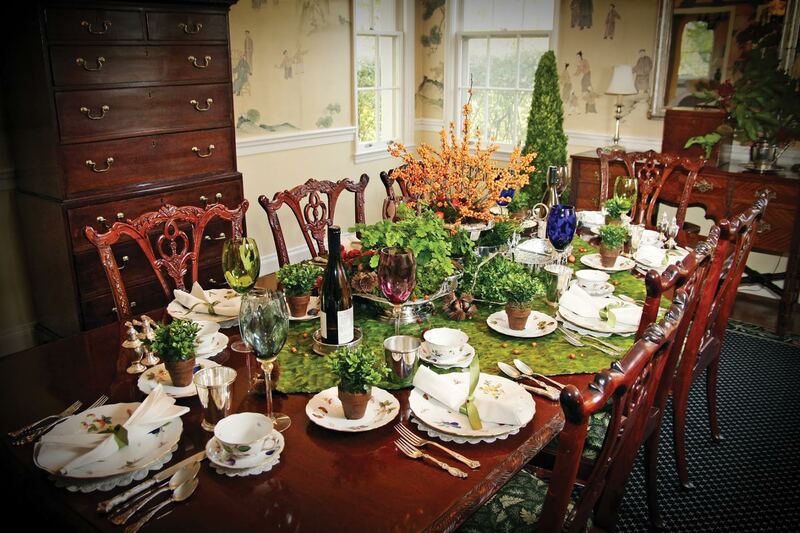 Imaginative mixes might feature a large magnolia leaf, tiny boxwood leaf, and an airy sprig of white pine. Needle evergreens offer the widest range of color variance. The feathery fronds of arborvitae (Thuja) are valuable in providing different colors and textures that range from green, to blue, to golden. White pine (Pinus), blue spruce (Picea), Arizona cypress (Cupressus), and many landscape-favored junipers (Juniperis) tend toward blue. Yellow-greens are seen in a host of spruces (Picea), and Chamaecyparis, a type of cypress. Rich greens can be harvested from the popular Leyland Cypress (Cupressocyparis), our native hemlocks (Tsuga), plentiful hollies (Ilex), and my personal favorite—yew (Taxus). An eye for something new and different will unveil a wide variety of less popular evergreens that are plentiful and perfect for consideration indoors. The lustrous, waxy leaves from Camellia, Aucuba, Euonymous, Osmanthus, Photinia, and laurels are great options that can be cut, and combined, in dry designs. Nandina, thought of first as a source for red berry bunches, lasts nicely in a vase or used with floral foam. 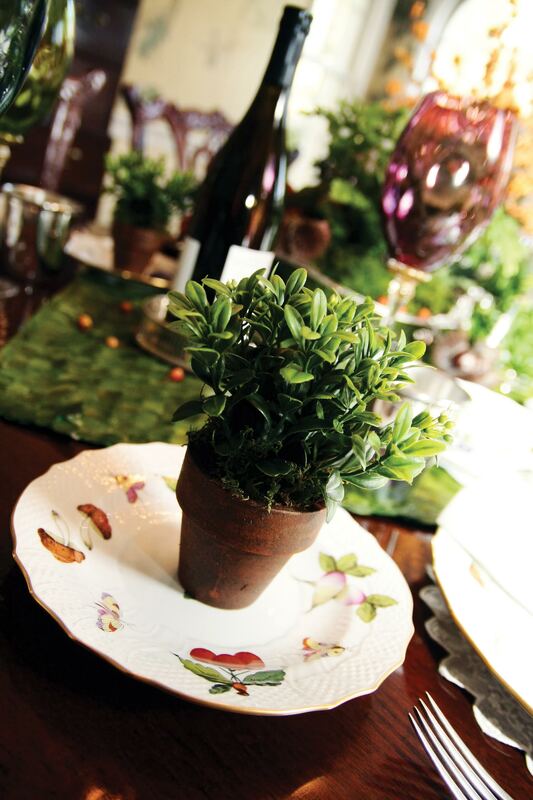 Daphne, English ivy, Pachysandra and Eleagnus are also garden evergreens that can be used in this way. Best known for its aromatic and culinary properties, rosemary adds an intensely fragrant complement to the mix. Upright, reaching only about six inches, Princess pine (Lycopodium obscurum) resembles a miniature evergreen tree. It can be found in damp open woods beneath tall evergreens and is distinguishable by its small bushy branching. A moisture lover by nature, it is best harvested and enjoyed closest to the holidays. By gardener’s standards it is the definitive holiday evergreen. Fresh-cut evergreens are not the only plants worth harvesting for festive arrangements. Seek out deciduous shrubs with interesting character or berries that will enhance unique designs. The much-sought-after, strong, leafless branches of winterberry (Ilex verticillata) are lined with an abundance of red or peach berries. Eye-catching deciduous dogwood features yellow or red stems, but is hard to find. 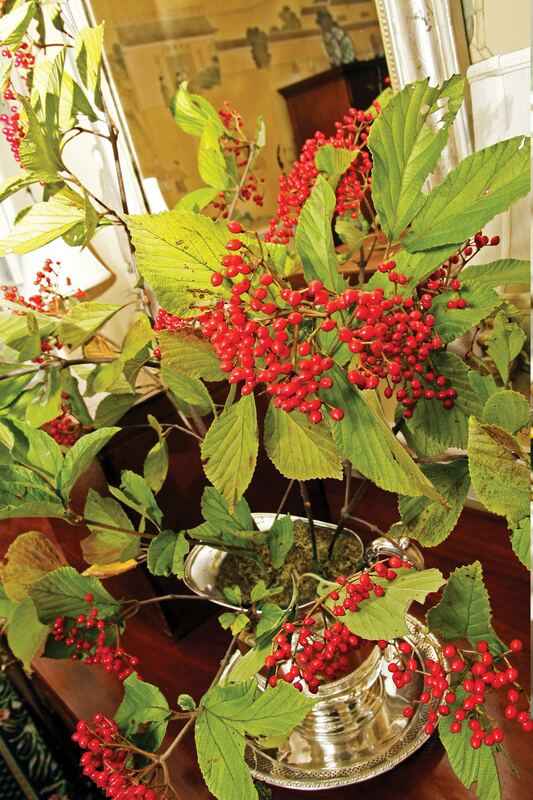 Both the winterberry and dogwood are great selections for landscape winter interest and future decorating. Also adding a striking effect to floral work, contorted willow is popular and easy to locate. Dashes of color lead the way for playful new ideas. An orchard of crabapples, lady apples, oranges and lemons burst with color to accentuate evergreens. Bright ideas also originate in viburnum berries, bittersweet, rose hips and osage oranges. Foraging for natural materials will turn up pinecones, sweet gum balls, acorns, nuts, moss, milkweed pods and the fiery-burnt color of sumac. Lichen, bird nests, feathers and other ordinary objects collected from nature present touches of personal style. Every glorious gift from the garden, field and forest can be gathered for inspiring ideas. Perhaps best of all, though, there is no right or wrong in the harmonious way nature’s gifts herald this special time of year. • To create your own garland, cut a length of rope to the desired size. Cluster favorite greens and berries to create small bunches or mini bouquets. Wire each bouquet separately, and wire securely again to the rope, overlapping each bunch in the same direction. • Need more red berries? Holly berries form on shrub growth from the previous year, which is why all the berries might be on the lower part of a cut stem. Consider cutting the stem and removing the leaves if you need more berries and less foliage. Holly berries can also be removed from the stem and used in decorating as cranberries might be. • If you like the look of a vase filled with nuts, berries or tiny cones, but also need water for fresh flower stems or evergreens, consider this trick: Place a smaller diameter vase or glass cylinder inside the vase. The interior vase holds the water, and the space between the two vases remains dry, to be filled with cranberries, acorns or even potpourri. • Swags are perfect for enhancing a lamppost, mail post, columns or the base of a stairwell. Making a swag is as simple as layering cut evergreens in a bundle. Hold the bundle with one hand until the size is achieved. Secure the bundle with wire at the base. Add a bow or top the swag with a smaller bundle turned in the opposite direction. HOME extends special thanks to Rie and Eddie Godsey for the use of their home for this photo shoot. 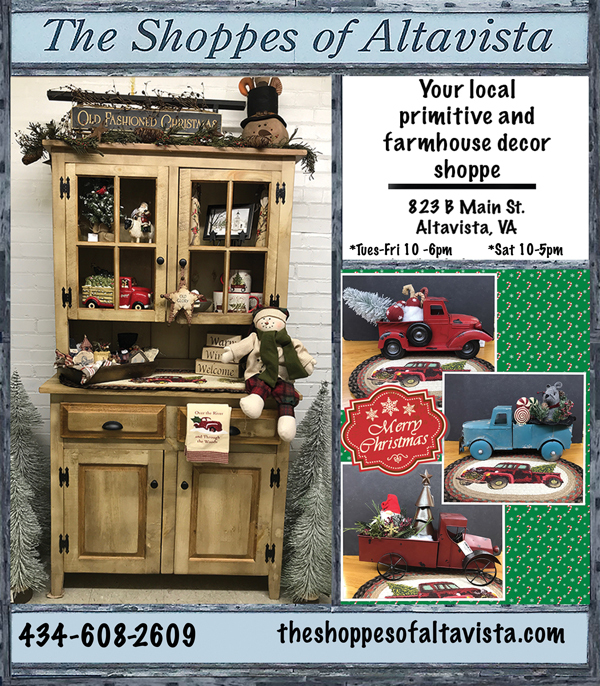 Kerry Giles is general manager of Lynchburg’s Farm Basket, where she puts to work her talents for creating extraordinary, beautiful décor, gifts and more for the home and garden. Here, Kerry shares some of her ideas on using Virginia’s natural bounty to decorate our homes during the holidays.